In the Byzantine Rite, a “synaxis” (“σύναξις” in Greek, “собóръ – sobor” in Old Church Slavonic) is a commemoration held the day after a major feast, to honor a sacred person who figures prominently in the feast, but who is, so to speak, overshadowed by its principal subject. The most prominent example is the feast of the Holy Spirit, celebrated on the Monday after Pentecost, since Pentecost itself is the feast of the Holy Trinity. 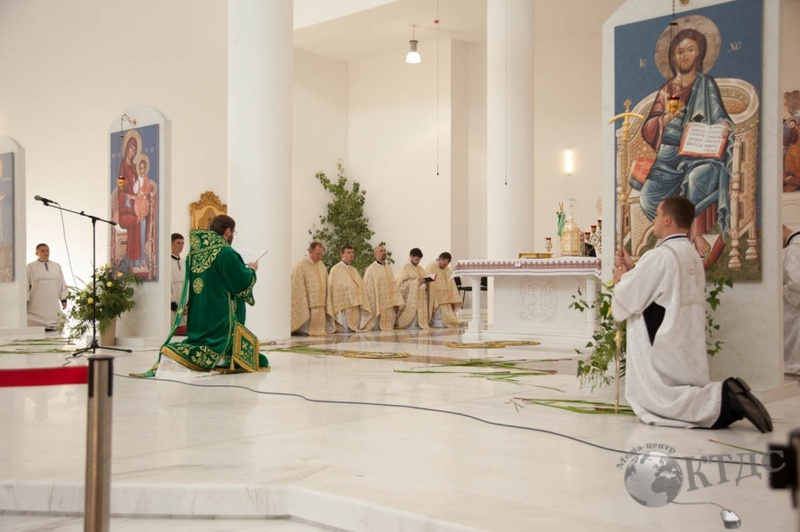 For those who read Greek, you can read all of the proper texts of this Vespers by following this link: http://glt.goarch.org/texts/Pen/p50.html; an English translation is available here. Since it is a long-standing custom of the Rite never to kneel in Eastertide, a custom which goes back to a decree of the First Council of Nicea, this Vespers also includes the ritual known as the “gonyklisia - the bending of the knee.” This consists of the recitation of a number of prayers interpolated between the regular Litanies (some of them extraordinarily long, even by Byzantine standards), which the priest ordinarily says while kneeling down done before the iconostasis, facing the people. Every Vespers in the Byzantine Rite belongs to the day following it; there is no such thing as Second Vespers, even for a Sunday or a major feast like Pentecost. 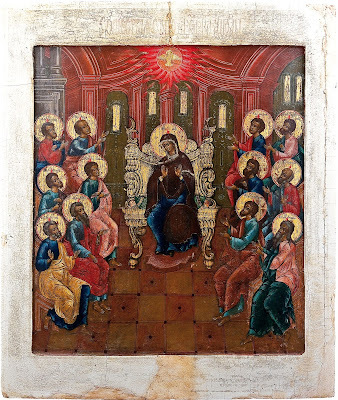 There, although this Vespers is sung on the evening of Pentecost Sunday, it is liturgically part of Monday, and therefore outside the 50 day period in which kneeling is prohibited in the liturgy. Here is the shortest of the kneeling prayers; the full texts are included in the links given above.